For interior and exterior use. Can be stained or painted after 3 hours. Excellent adherence and is easy to shape and sand. Can be applied on any type of wood, including exotic species, chipboard and plywood. Dries white in colour, can be drilled when cured and also overpainted with any type of conventional paint, varnish or stain. 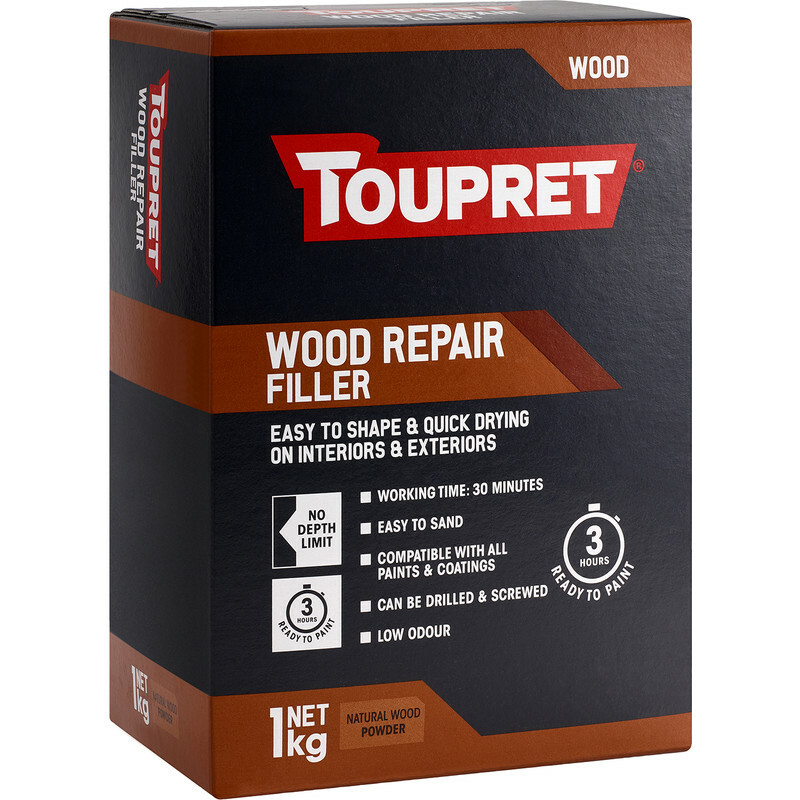 Toupret Wood Repair Filler 1kg is rated 4.5 out of 5 by 6. Rated 5 out of 5 by Timo7747 from Awesome I was dubious about this because of the price, but this product is just ace. It’s so easy to mix and work. After some repairs to some window sills this was left exposed to the elements for 3 months. It didn’t move shrink or crack. Great product. Rated 4 out of 5 by Dave wales from Easy to use Easy to mix and apply. Sets solid and can be sanded for smooth finish. Rated 3 out of 5 by BriDIY from Filling wooden window I bought this due to price thinking it would be an outstanding product. Nothing exceptional and I realised the normal fillier I buy does the same job at a third of the price. Easy to use but other brand filler mixes better. Not s bad product but in my very humble opinion, way over priced. Rated 5 out of 5 by daveey from Great filler You can't go wrong with any of the Toupret fillers and this is no exception. Rated 5 out of 5 by saidie01 from top filler being an amateur d.i.y. 'er i bought this product with high hopes and i can only say it is great, it filled vast cracks in a garden table and when sanded and stained you would never guess, it was easy to use and easy to apply, i would certainly buy again.